Woo-whoo! You just had the most magical moment of your life and have a sparkly ring on your left hand to show for it! But after the initial shock wears off, you may look at all the wedding planning to do and wonder, "What do I do next?" So in this installment of our Bride Advice series, we're sharing the first 5 things you need to do after you say, "Yes!" Read on to learn from our experience as wedding professionals, and as fiances who planned our own wedding! It can be tempting once you get a ring on your finger to immediately start wedding planning. But before you do, take a little time to enjoy the excitement of getting engaged! You just had the love of your life ask you to be his wife and spend the rest of your life with him. Don’t let the planning process overshadow the significance of what just happened! And don't just enjoy it now, figure out how you can keep enjoying this time! Wedding planning can get stressful. There are a lot of decisions for you to make, and everyone will be looking to you for answers. But it doesn’t have to be a stressful process if you keep the big picture in mind. You’re not just planning a big party, you’re planning the celebration of your marriage. So vow now to enjoy the process, and when stress comes, to take a step back and look at the big picture. Speaking of big picture, the MOST IMPORTANT thing you can do immediately after getting engaged is not wedding planning, but marriage planning! Seriously, if you get nothing else out of this blog, remember that. Maybe you and your sweetie have already had long conversations about the type of marriage you want...or maybe not. But either way, now is the time to plan for the success of your marriage. Take some marriage courses, meet with a marriage therapist or your officiant for some premarital counseling, or at the very least, have some honest conversations about what you want your marriage to look like. We believe this step is so important we gift our Sweethearts a copy of The 5 Love Languages to help them have these marriage-planning conversations. Because when the ceremony is over and you have all your wedding images in an album on your coffee table, the daily task of living in your marriage begins...and keeps going day-in and day-out for years to come. There are as many unique wedding styles as there are couples, so start talking about what you like...or what you definitely don’t. A massive party in a hotel ballroom with hundreds of guests? Eloping on the side of a mountain with just you two, your officiant and a photographer? Something in between? Talk through what type of couple you are and what ceremony is perfect for y'all. Decide what season you want to be married in, or if there is a specific date you'd like as your wedding date. Think ahead of life changes coming up in your calendar (i.e., graduations or new jobs) and figure out how those affect your wedding planning and/or date. Realistically consider how long you need to plan to achieve the wedding you want. If your busy schedule or the type of wedding you want doesn’t allow for a quick planning process, you may need to push the wedding date back a few months or into next year. The next thing you really, really, really should do is create a budget for your wedding. We know, budgeting is not exciting or glamorous. It’s so much more fun to pick out a wedding dress or go taste-testing for your cake. But trust us, having a budget allows you to make smart decisions when planning your wedding. Every consultation you have with wedding professionals will go so much more smoothly if you have at least a ballpark idea of what you can spend on their services. Having a budget also helps you know what’s important to you. Because if you’ve always dreamed of having certain flowers at your wedding and then discover it’ll cost hundreds more than you thought, you can decide if there are other areas of your budget you can adjust...or figure out an acceptable alternative for your floral arrangements. So talk with your fiance, talk with your parents (if they’re contributing to the budget), and figure out what you realistically can and want to spend on your wedding. If you need help figuring out your budget, you can reach out to wedding planners for a budget consultation. This is a meeting where you can talk about your wedding plans and an expert will help you craft a budget for your big day. 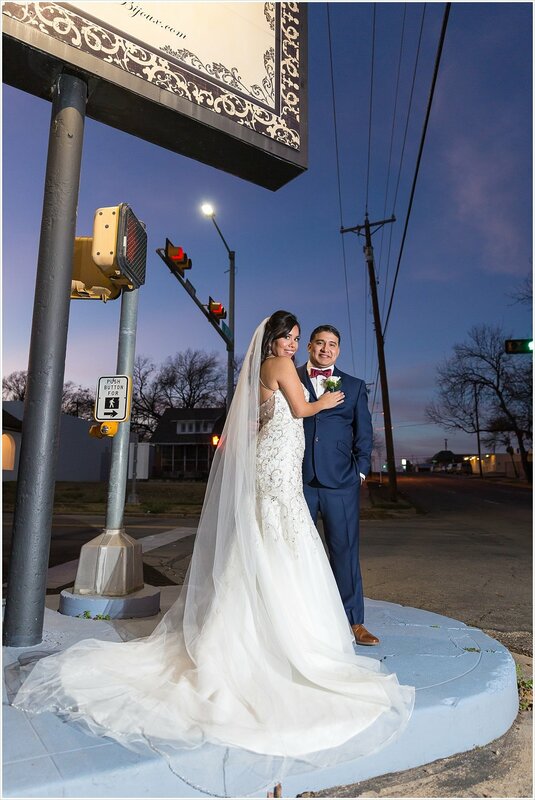 Two central Texas planners we love who offer this service are Taylor Bible Weddings and Karla McNeill Events. A planner’s knowledge of the realistic cost of weddings in your area is extremely valuable, and they can even help guide you in the best ways to get the most out of your budget and have the wedding of your dreams. Once you have a budget in place, you can now start ticking off all the actual planning to-dos on your list. But of all your tasks, there are 3 big wedding professionals' services you need to book ASAP after getting engaged. Your venue - Where you are going to get married is one of the first decisions you need to make, because this is a huge factor in the date of your ceremony. If you have a specific date in mind, you’ll need to find a venue who has that date available. If you have a general time of year in mind for your wedding, picking a venue will help you pick your wedding date based on their availability. Some venues, particularly ones whose main purpose is weddings, book months or even a year out. So you don’t want to wait in securing your venue, especially if you want a certain date, or a certain venue! Your planner/day-of coordinator - We’ve already highlighted the obvious and not-so-obvious reasons you should have a wedding planner on the blog, so we won’t discuss that here. But if you’re even thinking you need a planner or day-of services with a wedding coordinator, you should hire this wedding professional very soon after getting engaged. She or he will be able to help you plan your budget, design your dream wedding, and help connect you with the perfect-for-you wedding professionals who will make your dream a reality. Your photographer(s) - We don't list your photographers next because we’re photographers and we think we're the most important. Trust us, we don't think that. No, the reason you should book your photographers ASAP is because our calendars get full fast, especially if you are getting married on a popular day (like say, Saturday 8-18-18). Most other wedding professionals have a team working for them and have the ability to commit to more than one wedding any given day. But unless your photographer has associates working for them, they can only photograph one wedding a day. And once they’re booked, they’re booked. So you really don’t want to wait to book your photographer and then not be able to get the one you want because they’re already photographing someone else’s wedding on your day. If you do these 5 things ASAP after getting engaged, you'll set you and your Sweetheart up for success and have great memories of the time you planned your wedding! Did any of these 5 steps seem surprising, or super helpful? Let us know in the comments below! It's here! It's here! Our first ever year-end wrap up blog post! 2017 has been amazing here at JMP, and we have worked with the most kind, beautiful, and fun Sweethearts this year. #Blessed! So as we are prepping the bubbly for New Year's Eve and looking ahead to 2018, we thought we'd look back on all the engagement portraits and weddings we photographed in 2017 here at Jason & Melaina Photography! And what a year it's been! Keep scrolling to see our favorite portraits from our J&M Sweethearts' engagement sessions and wedding stories, and read on to learn some neat behind-the-scenes stuff too! Spring - Engagement Photos, Rainy Weddings, and a special Sweetheart session! We began 2017 with Michael & Pamela's engagement session in Belton. We had not met Michael or Pamela prior to this evening, and we had also never photographed an engagement session in Belton. But thanks to some prior scouting, and to Michael & Pamela being some of the nicest people we've met, their session was amazing! We connected right away and spent most of the shoot laughing together, and we found some really beautiful places in Belton that made for the perfect backdrop for their portraits. For more of Michael & Pamela's engagement session, go here. Jason & Anne were our first wedding for 2017 on Valentine's Day weekend. These two met through their small group at Antioch Community Church, where they had their ceremony. It was really important to Anne we get a picture of her and her husband under the Antioch arch, so we made it a priority to squeeze in a few moments for that portrait before heading to the reception. And this last image right before Jason & Anne ran through their rose petal exit is one of our favorite stolen-moments shots we've captured for a wedding. They stopped unexpectedly for a kiss right before leaving, and Jason happened to look back over his shoulder as he was getting into place with his camera and snapped a quick shot. For more of Jason & Anne's Antioch/Palladium wedding day, go here. In early March it was finally wedding day for Michael & Pamela. They were married at La Rio Mansion, and we were all set for a ceremony under their beautiful trees. But the day of brought rain and plans had to be changed. The ceremony was moved into the covered entrance, all the reception tables were moved under patios, and a tent was put up to cover the dance floor. Even though the plans changed and we all had to think quick on our feet, Michael & Pamela's wedding turned out so lovely. Michael's reaction when he saw Pamela coming down the aisle is still one of my favorite reactions, and the rain in the background of their portraits made everything seem even more magical. 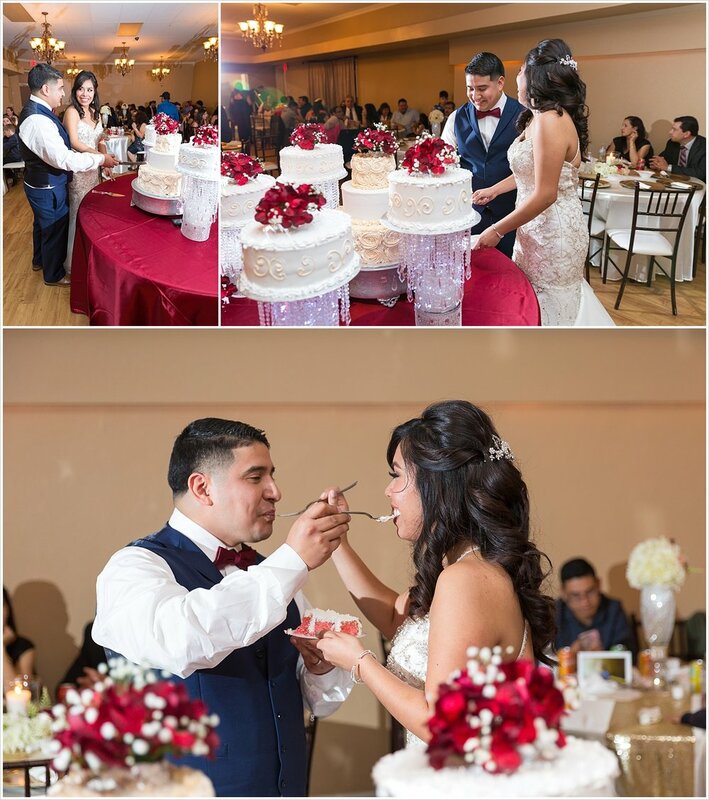 For more of Michael & Pamela's LaRio Mansion wedding, go here. Cory & Jackie are some early J&M Sweethearts, before J&M Sweethearts was even a thing! We photographed their engagement session 8 YEARS ago! This year they welcomed their first little one, but before the birth of their daughter they wanted to have one last portrait session just the two of them. 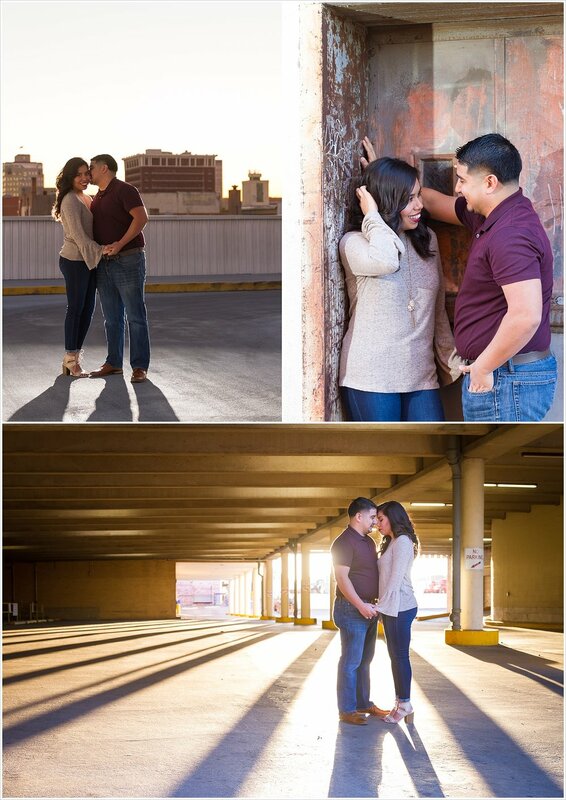 So we scheduled a sweetheart session for the two of them around some of our favorite spots in Waco. Jackie and I are both fans of Gilmore Girls and often discussed the Netflix movies on Facebook together. So when she suggested we do a birth announcement type photo in a gazebo, a la the famous final 4 words, this Gilmore Girls fan was all over it! For more of Cory and Jackie's session, go here. In late April we drove out to Marble Fall to meet up with Jacob & Meghan. Jacob's best friend helps manage Sweet Berry Farms there, and Jacob & Meghan really wanted their engagement session at the farm. We've started digging in deep with our Sweethearts this year to help them pick locations for their engagement portraits that are meaningful to them. We have great location ideas to offer, but we feel like it is so much more special if our couples pick locations that help tell the story of their relationship. So when Jacob & Meghan suggested this fun farm that Jacob had a connection too, we were all for it! While we waited for the strawberry fields to close to visitors, we drove over to the farm's wedding venue area. Once there, we saw this great grove of trees with all this sunlight shining through, and a field of yellow flowers. We knew we had to get our couple in those spots for some of the portraits, and man, they turned out so great! When the farm was finally closed to visitors, we headed back over to the rows of blackberry vines and strawberry fields to finish the session. We came home with some amazing portraits and some full stomachs from all the fresh strawberries we ate during it! For more of Jacob & Meghan's engagement session at Sweet Berry Farms, go here. Summer Lovin' - Engagement sessions in meaningful places and some gorgeous weddings! Early May brought the second time we've photographed one of our sibling's weddings. Jason's youngest sister, Julie, married her sweetheart in Asheville, North Carolina, so we road-tripped it for a weekend celebration of these two. 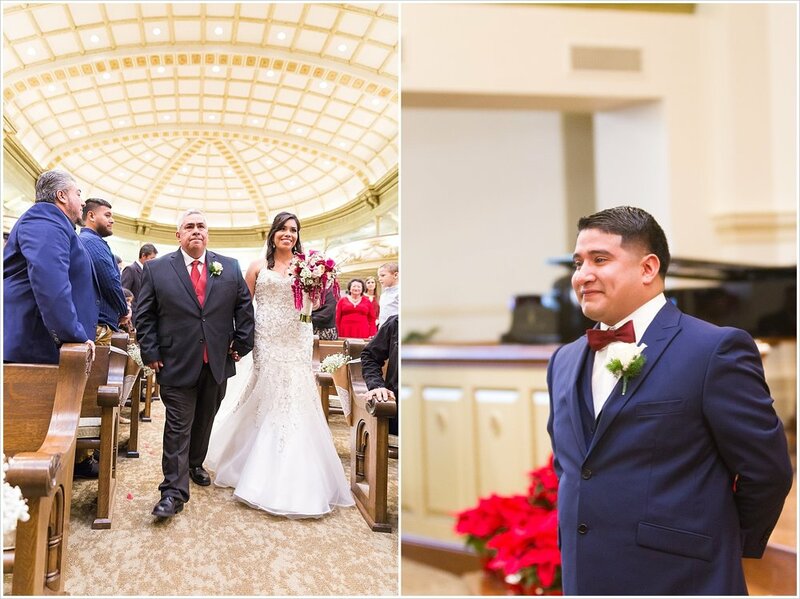 Julie & Anthony are a couple who love to laugh, so it was such a joy being around them! And we're not just saying that because they're our siblings! Photographing your sister's wedding can prove tricky, especially when it's time for family portraits. But luckily a bridesmaid stepped up and took over our camera for a couple of those. We may look a little out-of-place in our black attire, but we love that we could be there to serve our sister and brother-in-law! For more of Anthony & Julie's Asheville, NC wedding, go here. In June we drove up to the Dallas area for Randell & Fawn's engagement session. Fawn found us through our Instagram post from Michael & Pamela's wedding exit, and thus far we had only texted, emailed, and had one Skype call together. But as soon as we were with Randell & Fawn in person, we knew we had found some fun new friends and were so excited to call them Sweethearts! When we talked through where to do their engagement portraits, we again asked about meaningful locations for their story. Fawn suggested we start at the apartment complex they met at, and even brought out their friends who still lived there. Randell, Fawn, and this group of friends used to sit out together in the breezeway between their apartments, and it was so much fun to recreate those scenes for their engagement session! We finished off the shoot at the park where Randell proposed to Fawn over a picnic date. As we were about to leave, Jason saw the sunset and the clouds, and we found a huge puddle from recent rain, so we set up one final burst of photos. And man, were we glad we did! For more of Randell & Fawn's engagement session, go here. In early summer some friends of friends contacted us about photographing their wedding in August...as in this August! We went from meeting Steven & Erin in early July to photographing their wedding in early August! But even though it was a quick relationship, we're so glad it's continued, because Steven & Erin have actually joined the small group we lead through our church. So it's fun to have some Sweethearts in our small group and to stay connected to them in that way! Steven & Erin's wedding was full of intentional, sacred moments. 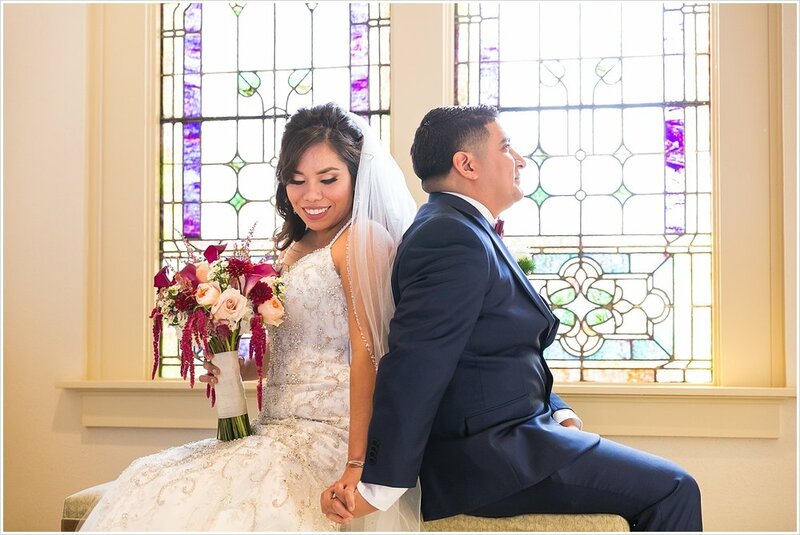 Immediately after their first look, Steven led Erin to the piano and played "In Christ Alone" for her, and they worshipped together before their wedding. Then after the ceremony, they prayed together at the altar where they were married. It was special to witness those moments, to hang back and capture them forever so they can look back on them in the years to come. For more of Steven & Erin's wedding at Central Presbyterian, go here. 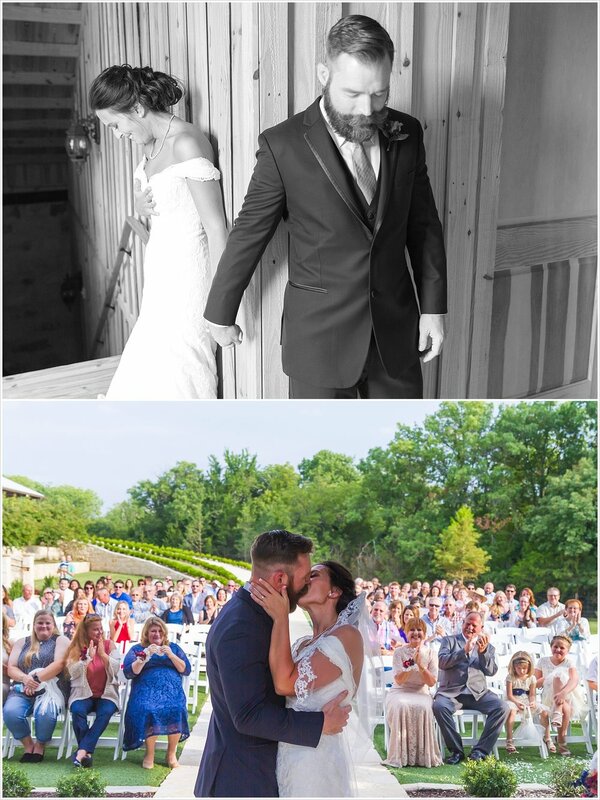 August also brought Randell & Fawn's wedding at The Springs venue in McKinney. There are so many moments from this wedding that are amazing, you should just go read their whole blog post. But when we think of this wedding, some images stick out to us. There was the breath-taking bridals we were able to get in the early afternoon. There are the all the fun photos of Randell & Fawn tearing it up on the dance floor, surrounded by all their family and friends cheering them on. There's one of the sweetest first touches we've ever seen. And then there's this last image. Back at their engagement session, Fawn told us she wanted to have a shot of her and Randell's first kiss as husband and wife with their loved ones in the background. So Jason & I figured out how to make it happened. We prepped the minister before hand and kindly asked him to step aside after pronouncing them husband and wife, and thankfully he remembered! Jason stayed crouched down in the aisle on the front row to get our traditional just-married kiss shot, while I stood behind Randell & Fawn on a step stool to get myself taller. Then Jason and I just used Randell & Fawn's bodies to hide each other in our photos! The first kiss is such a whirlwind moment, it only lasts a few seconds really, so you prep yourself and hope everything goes according to plan. But when we got home and uploaded our cards, and realized we got the shot, we did a happy dance! For more of Randell & Fawn's wedding at The Springs, go here. We finished out the summer with Charles & Alex's engagement session. These Sweethearts met in judo class, so we had thrown around the idea of taking engagement portraits there or somewhere in Cameron Park. But then Charles called us one day and told us he wanted to surprise Alex with horseback riding for her birthday, and asked if we could do the engagement session then too. Of course we said yes! This was our first time photographing our Sweethearts on horses, and it was amazing! We got some fun action shots of them riding in from their lesson, and then were able to incorporate the ranch in the remainder of their portraits. We even had a pony photobomb them, but we just rolled with it and had them interact with the little guy. So fun! For more of Charles & Alex's horseback engagements, go here. Fall - A Texas Reception, romantic weddings, and engagement portraits for some 2018 Sweethearts! You may remember Brian & Kendra from their epic NASCAR engagement session or their second engagement session on Brian's grandmother's farm we did at the end of 2016. Though they were married in Kendra's home state of Ohio in the summer, they had a second reception for all their family and friends in Texas in September. It felt a little weird to hang out at our apartment until the afternoon, since there was no ceremony for us to photograph. We're more used to being with our Sweethearts all day! 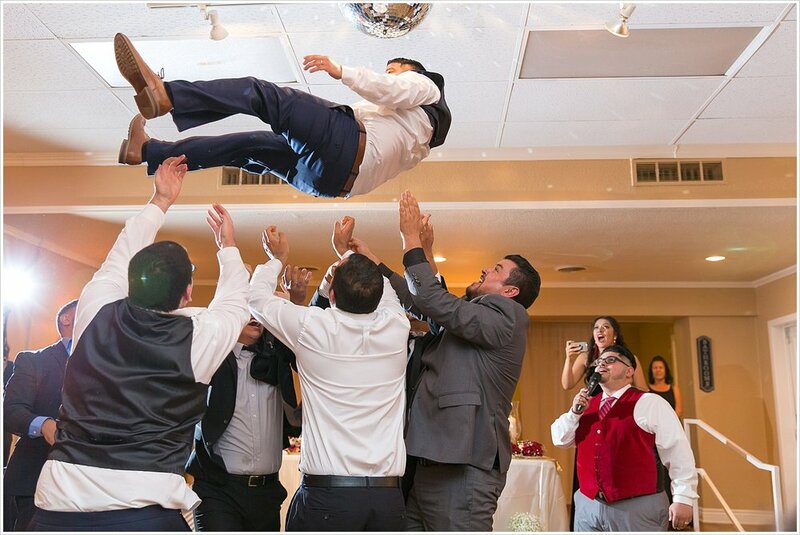 But this reception was still so much fun! We know Brian & Kendra as fellow wedding vendors, so being at their reception was like hanging out at a party with all our friends! They also did a Grand March dance, which is always fun to watch and photograph! For more of Brian & Kendra's Texas reception, go here. October brought Charles & Alex's wedding day. This wedding was special for us because it was the first time we've photographed a wedding in our own church! 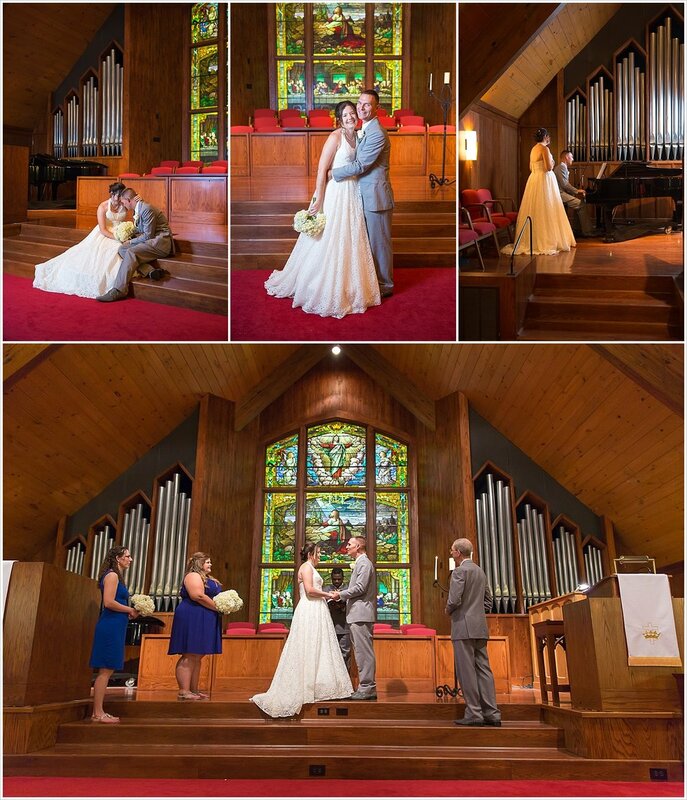 Charles & Alex are fellow members at Highland Baptist, and so they were married in Highland's chapel. Our worship minister played the ceremony with the bride's brother, and our pastor officiated. We often work with our fellow wedding vendor friends at weddings, but this time we were working with our friends from church! This wedding was also special because Alex's grandmother flew in from Taiwan to attend. We've learned through our own wedding that weddings are often the few times an entire extended family are together. So we know those family portraits from the day are important, because having everyone together is rare. It was an honor to photograph Alex, her mother and her grandmother together and to be able to give them those portraits to have as family heirlooms. For more of Charles & Alex's church wedding, go here. Fall ended up being a busy time for us, but we loved it! We had weddings, family photo sessions for Christmas cards, and then engagement sessions for our early 2018 Sweethearts. Our first 2018 Sweethearts were James & Elizabeth. James proposed to Elizabeth while they were fishing together, so of course we wanted to photograph their engagement portraits somewhere that helped tell that part of their love story. And when the sunset works out perfectly and our Sweethearts kill it looking so in love, it's an awesome day! Connecting with our Sweethearts and helping them feel 100% comfortable in front of our cameras is our #1 goal. So while we know giving our couples beautiful pictures to hang in their home is a great end result of an engagement session, our real goal here is helping them feel at ease with our posing technique and in front of our cameras. It just makes the wedding day so much easier when we've already photographed our Sweethearts! For more of James & Elizabeth's engagement session, go here. Okay, I know I just said we do an engagement session before our Sweethearts' wedding day to help them feel at ease in front of our cameras. But in the case of Steven & Erin, the schedule just didn't allow it! We gift each of our Sweethearts an engagement session, though, so we still wanted to make it happen for them! Erin works for Baylor University, and when they were dating Steven & Erin would often walk around campus together and grab ice cream at Heritage Creamery. So for their engagement portraits we decided to recreate a Baylor date night for them! I love that these pictures tell the story of their relationship, and that they can tell that story to future generations when they look at them. For more of Steven & Erin's engagement portraits at Baylor, go here. Robert & Abbie were our second 2018 Sweethearts to have their engagement session this fall. We knew we wanted to finish our session with them at the Suspension Bridge, because that's where Robert proposed to Abbie while playing a game of tortilla toss. But we also wanted to get some images for them in an outdoor setting. So my daughters and I went exploring in Cameron Park and off of one trail I found a steep little path that led to this rocky outcrop on the Brazos River. I normally advise our brides-to-be to wear high heels for an engagement session (read here to find out why! ), but I was so glad to see Abbie chose these adorable flats to wear so she could hike down to the river for these portraits! Also fun behind-the-scenes note, in the kiss-in-a-dip portrait I'm hiding behind them with a flash, and because they dipped I didn't have to be edited out at all! For more of Robert & Abbie's engagement portraits on the Suspension Bridge, go here. November brought Jacob & Meghan's wedding, and we were so excited! We hadn't seen Jacob & Meghan since their strawberry field engagement session way back in April, and we were happy to be with them again. Also, we were going to be working at a new-to-us wedding venue and with some new friends in the wedding vendor community, so we were excited to make all these new connections! When I think back on Jacob & Meghan's wedding, all the special little moments are what stick out in my mind. Meghan with her girls, their foot-washing ceremony after their vows, and how even though it was so cold our Sweethearts trusted us to leave the warmth of their meal to stand out in a driveway as the sun was setting so we could get a beautiful moment for them. Also, Meghan had made so many special little touches for their ceremony. 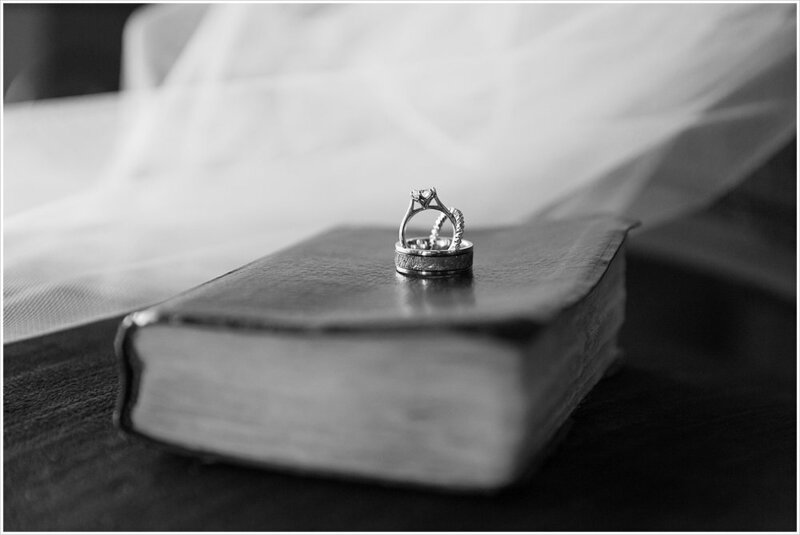 She had her parents' wedding bands tied to her bouquet, a piece of her mother's wedding dress sewn into her own dress near her heart, and the Bible her ring bearer carried was her new father-in-law's Bible he had received when he became a Christian so many years ago. Jacob & Meghan's wedding would have been beautiful regardless, but all these special moments and sentimental touches made it such a meaningful day. And since we're talking about some behind-the-scenes stuff in this post we didn't share in the original blog, shout out to Travis from Cinderella Films who helped us out with his flash so we could get this last kiss through the limo's tinted windows before they drove away! It took 3 flashes and 3 of us set up in different places, but the shot was worth it! For more of Jacob & Meghan's wedding at Bearcreek, go here. Winter - A Christmas wedding for a couple of Sweethearts! We finished out 2017 with Henry & Cassandra's engagement session and wedding day, all in December! We didn't meet these Sweethearts until November, but luckily we found a Saturday that worked for all our schedules to fit their engagement session in before their big day! We also were excited when they said they wanted to have a city vibe for their engagement photos, because we had some fun new spots downtown we wanted to try out. And as the sun was setting we were glad Henry & Cassandra were willing to hop in the back of our minivan to head to the top of a parking garage so we could get the sunset and the Waco skyline. For more of Henry & Cassandra's engagement session in downtown Waco, go here. 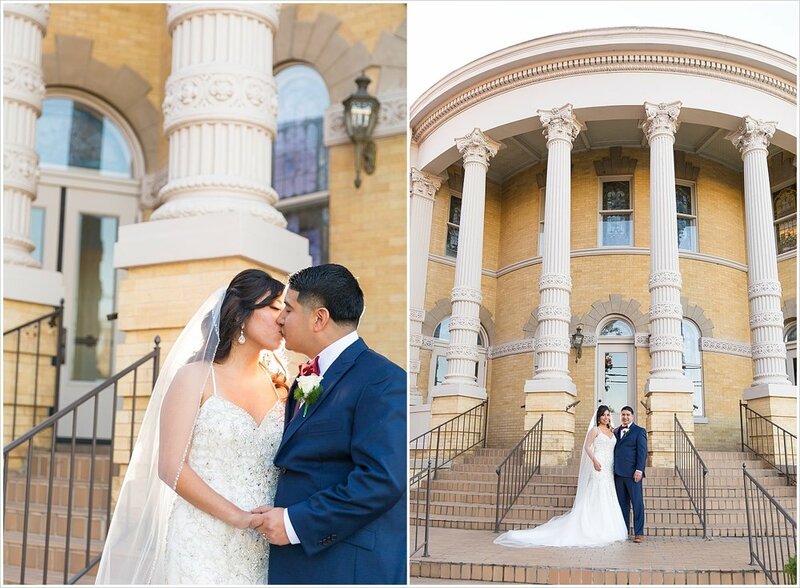 And then just 2 weeks later on Christmas weekend we photographed Henry & Cassandra's wedding at First Baptist Church, Waco. If you've never been inside this historic sanctuary, you are missing out! 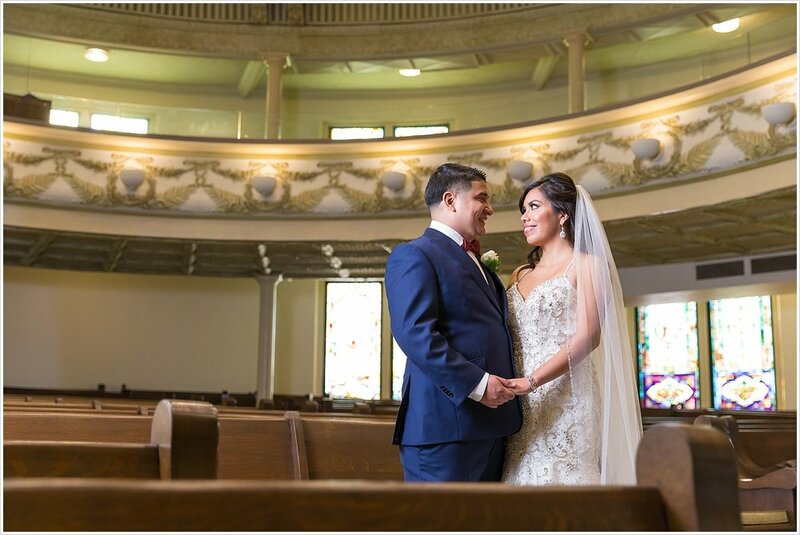 The soaring ceilings and stained-glass windows throughout the church are breath-taking, and it was a dream to photograph in there. Also, their wedding reception was a first for us in that we photographed all the family playing fun games together on the dance floor. You'll definitely want to check out their blog post coming in early January to see all the fun! 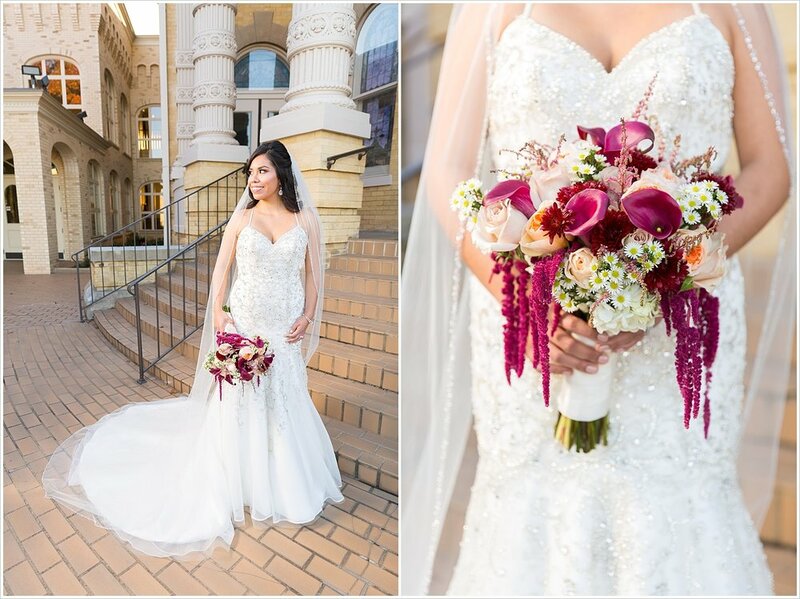 Earlier in the year our good friend, hairstylist Jessica Gudino, asked us to help her out with a bridal styled shoot. She wanted to showcase her team's talents for bridal hair and makeup, and got 2 gorgeous bridal gowns from our friends at Georgio's to use. We met them in East Waco for the first portion of the shoot, photographing our model at Rapport Academy. But when the sun set Jason headed with them back to Jessica's studio, and they set up some more moody shots utilizing our off-camera flash system. The end result isn't our normal style when we're photographing a bride on her wedding day, but it was fun to play around and get some more moody, model-like shots! For more from this bridal style session, go here. At Brian & Kendra's reception, their wedding consultant Lois Ferguson, told us to get together with the Sweethearts and she would take our picture with our camera. It was a perk of working with fellow wedding vendor friends! We realized this was the first time we've had our picture taken on the wedding day with our Sweethearts, and now we're wondering if we should make it a thing! And that's a wrap on 2017! Looking back through all these engagement sessions and wedding days stored on our hard drive was so encouraging. It's easy to give a cursory glance back over the year and vaguely judge it a good one. But to go through and pick out favorite images from each session really drove home the fact that we've had some amazing opportunities with our Sweethearts in 2017! So if you're reading this and you were one of our 2017 J&M Sweethearts, thank you so much from the bottom of our hearts for being awesome and amazing and for picking us to be your photographers. We consider you all BFFs now, and would love to go on a double-date with you if you ever have a free night in Waco! As this week ends and we look ahead to 2018, we can't help but be excited for what the future holds. We really feel like we've found our people and 100% of our Sweethearts are amazing couples who become our friends. So 2018 is only going to bring more of them in our lives and WE. CANNOT. WAIT!